In town for the President’s Cup golf tournament at Harding Park, Michael Jordan received a polite chastising from the folks that run the course. A photo of Jordan — who is serving as an honorary assistant to US captain Fred Couples — puffing on a cigar during a practice round caused the controversy. 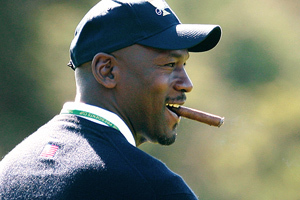 In a perfect world, Jordan likes to smoke a minimum of three cigars per round. A violation of the smoking ban can cost as much as a $100 fine, and methinks Jordan probably has that in the bank. “But don’t expect me to ask him for it,” city attorney’s spokesman Matt Dorsey told the SF Chronicle. « I’ll Shove that Whistle Where the Sun Don’t Shine!